I was blog hopping the other day and came across this very talent young chef blog and she made Loh Pak Koh. And I since I had a daikon in my fridge I decided to make some. 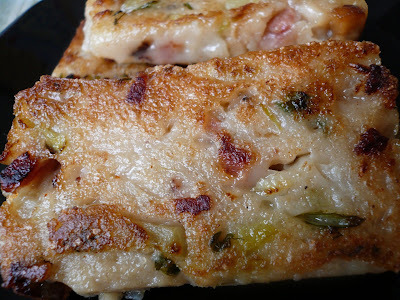 This is the delicious savory cake served in most dim sum places and sometime during New Year's Day as a symbol of prosperity and rising fortunes. 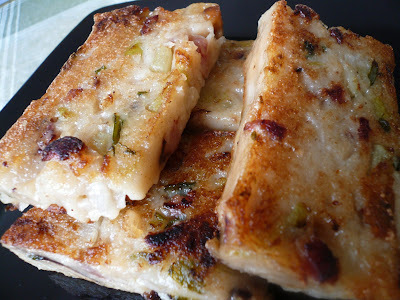 Turnip cake is made with Chinese turnip or Loh Pak which is a type of daikon radish. The cakes are first steamed, then pan fried giving each slice a crispy exterior. 1) Mix rice flour with 1 cup of water. 2) Heat 2 tsp of oil in a skillet or wok and stir fry shallots, Chinese sausage,mushroom, shrimp, and green onion for 2 to 3 minutes. Add daikon, 3/4 cup of water, salt and pepper to taste. Bring to a boil and then add in the rice flour mixture. 3) Continue to stir until mixture thicken. Remove from heat. 4) Pour mixture into a well greased square or round pan and steam over high heat for 45 minutes. 5) Cool or chill overnight. After cooling, cut the cake into 1/4 in slices and pan fry until both sides are golden brown. 6) Serve with chili sauce. At fisrt glance, I thought your kuih name is Pak Lah. I am really really salivting now! I am getting crazy now! YUUUUMMMMMY! I like this with that sweet (oyster?) sauce. Quite a bit of work for me to make now but will definite try later. Like Cath, I almost died laughing at Zue's comment. Hilarious! LCOM, too bad you live so far away. If not I can share some with you. Puteri, one or two slice should be ok, right? Cat, is not that difficult to make. BBO, ha haa.. come over to my house and you can eat as much as you want. Rita, I think the sauce is 'tau cheong' sweet sauce. Give me a call if you feel like making it. walio.... so delicous, we can open dim sum shop oledi! These are so yummy. I love them like that, from the dim sum restaurant type. Delicious! BBK, yeah lets open a dim sum place ha haaa..
Jadepearl, thanks for stopping by. 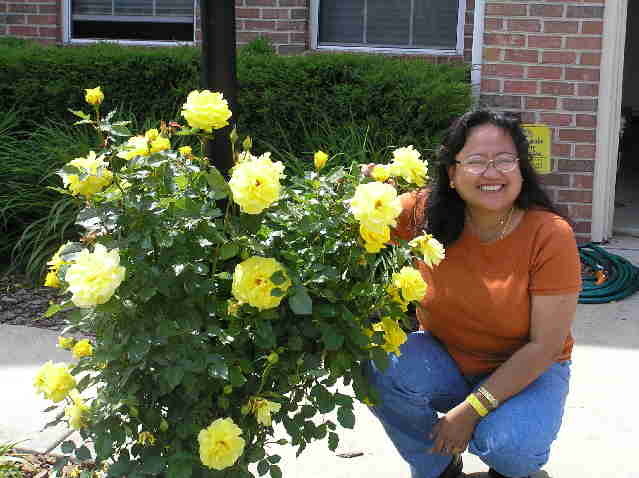 i like lo pak ko! Christine, hope you try this out. I made this last nite. Had it for breakfast this morning as it is, without frying. Absolutely delicious. Omitted the Chinese sausage though, cos I don't have them ready in my pantry. Still...it was very good. Thanks for sharing. I've tried couple of your recipes and they all turned out very well. I just wanted to thank you for sharing your recipes with us. It amazed me how easy and simple it was to make cookies, snacks etc. Thank you so much and keep up the good work! Natasya, glad that you try out the recipe and likes it. Winkhi, thanks for your support and your kind comment. I have tried a few of your receipes and my 4 years old loves it and we love it too. Her Kindy Teacher asked if we can do the Rainbow Glutinous Rice Cake next term as one of the activity. Thank you for sharing your experiences. You are absolutely talented. Finally tried this recipe, its delicious as usual. Didn't know what to expect but I followed your recipe instructions. I kept assuring myself that if Gert gives this instruction it will be fine. Thanks !!! Thank you so much for the recipe. Tried it and it was awesome. Only thing that I have altered is I have put in some corn starch. Can this be cooked in the microwave, rather than steamed? If so, how long for?